I have been on a bit of a gin kick lately. It started with a simple Gin & Tonic made for me by our very own Colleen McGarry, made with home-made tonic from another friend of ours. I was in love and have been exploring Gin cocktails ever since. What better & cheaper way to learn about cocktails than making them yourself? I was at a wine shop buying some St. George Mt. 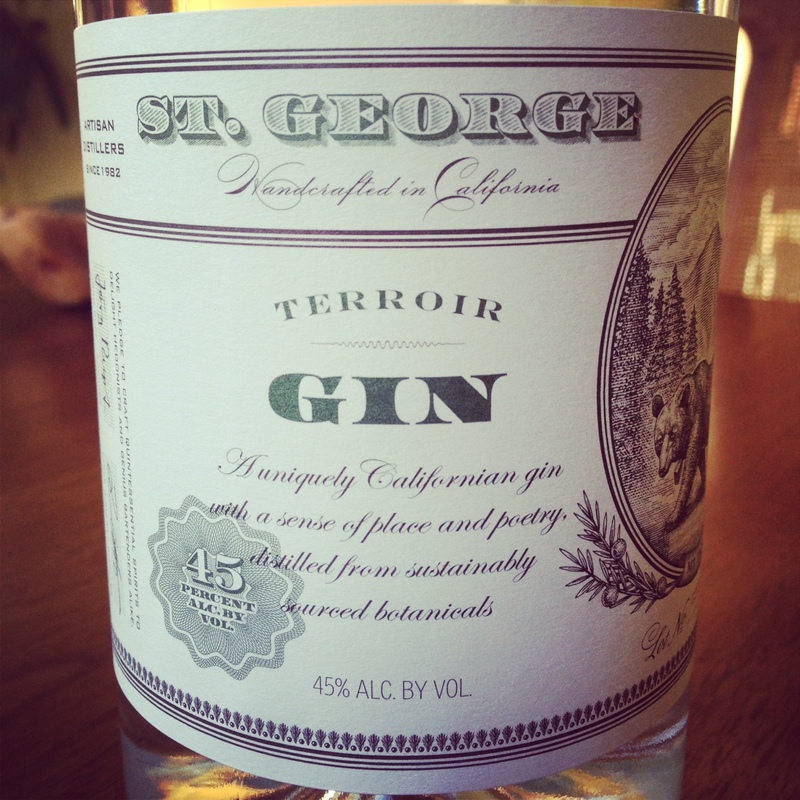 Tam Terroir gin ($31, KLWine.com). Who doesn’t love California’s terroir? I dare you to tell me you can’t replace the idea of garrigue with chapparal. This gin is lovely; Inspired by the coastal forests of Mt. Tam, it has aromas of Bay Laurel, Douglas Fir and coastal Sage. This was clearly exactly the gin I needed in my life. I happened to also be buying some sparkling wine, and the guy at the counter mentioned I was just a few ingredients short of a French 75. I was intrigued by the idea of a fancy new cocktail that I’ve had only once before, and that was before I discovered that I love gin. It was at the Claremont Hotel’s restaurant Paragon (which is awful, by the way, but if you are at the Claremont you don’t have a lot of choices). The cocktail was great, and so I decided to poke around the internet to distill a recipe. 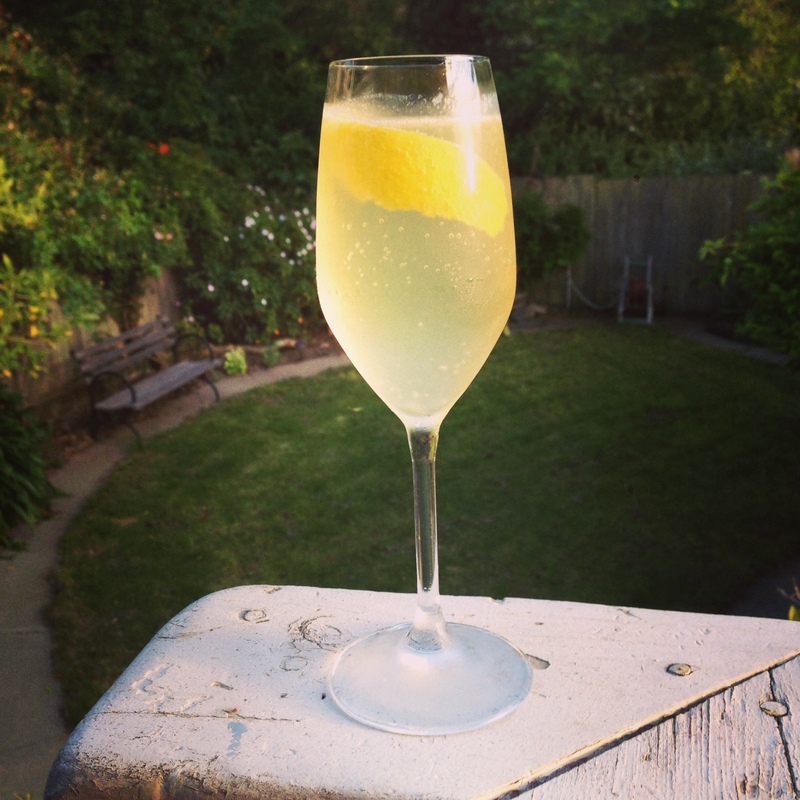 I came across the NY Times version and I trust them, so here’s my spin on their rendition of the French 75. 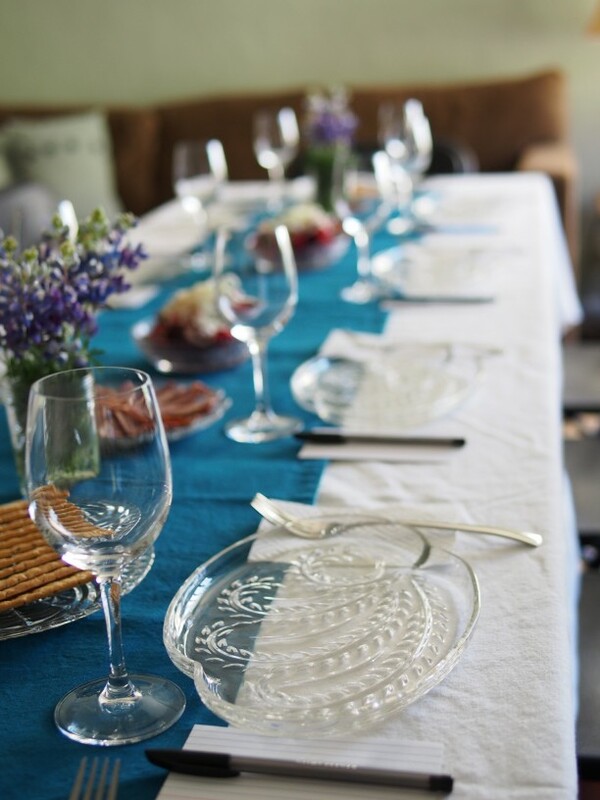 Chill your champagne flutes, glasses, what-have-you. With your vegetable peeler, peel the zest of the lemon for your garnish & set the zest aside. Cut your peeled lemon in half, and squeeze the juice into a small jar. Fill your shaker with ice. Measure & pour 1 oz. 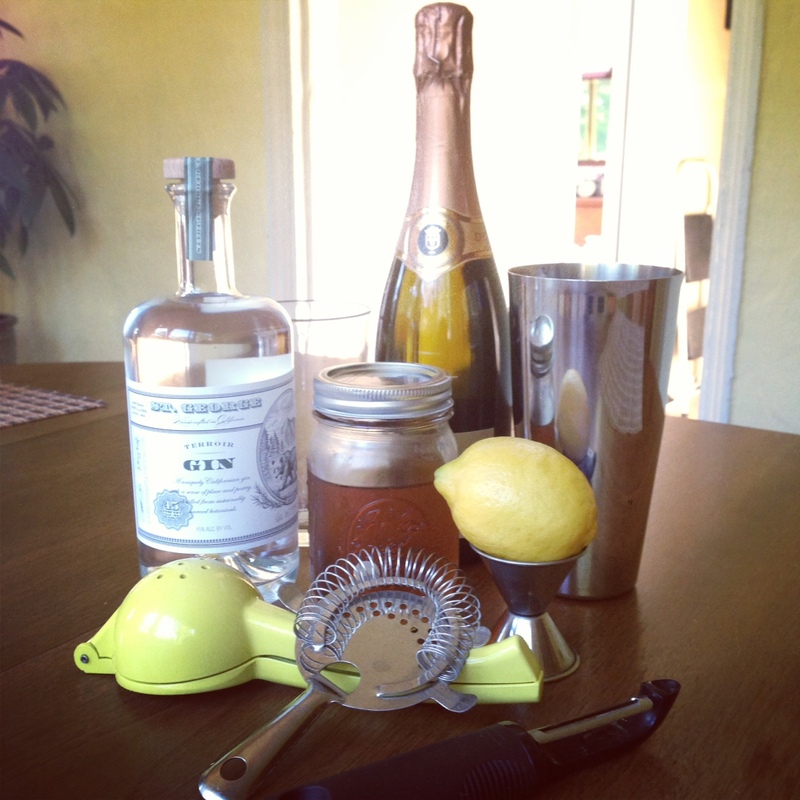 gin, 1/2 oz lemon juice & 1/2 oz simple syrup into your ice-filled shaker. Put the pint glass over your shaker (if it doesn’t have a lid) or the lid and shake for 5-10 seconds. Remove the pint glass or lid from your shaker, replace with a strainer, and strain the good stuff into your chilled glass. Top off with sparkling wine (about 2 oz). Twist your lemon zest over the glass, wipe the skin around the rim and drop it into the drink. Enjoy this tasty adult beverage on a warm summer night, preferably made at home and consumed in your own back yard. Invite some friends over; you went through the trouble of buying and opening a whole bottle of sparkling, you might as well share! If you’ve ever walked into a fancy restaurant in California during the spring-time, you have probably seen Ramps on the menu, complimenting your favorite main courses. These seasonal little nuggets of oniony goodness are basically wild leeks, which have recently found fame on the menus of fancy restaurants all over America due to their intoxicating aroma and good looks. Ramps have deep roots in Southern Appalachia where they are used in traditional recipes and in the past were used as a tonic to ward off the ailments of winter. I have not heard of ramps growing in the wilds of California, but you can certainly buy them here at specialty grocery stores. Out here we seem to have this other variety of useless wild onions that pack no flavor and will take siege of your backyard given the chance (ask me how I know). I buy ramps at the Far West Fungi stall in the San Francisco Ferry Building Marketplace for $5 a bunch. I am sure those in Southern Appalachia would balk at the price, but let’s be real; this stuff is shipped across the country. If they were local, they would cost at least twice as much (har). 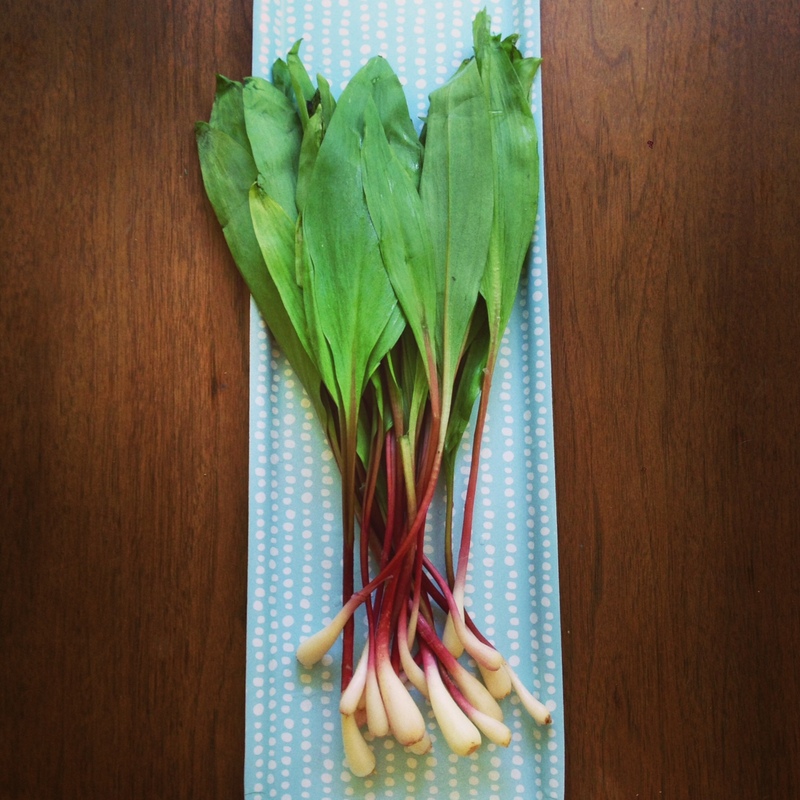 Ramps have a pungent garlicky-oniony smell and look much like a green onions. They are best served with foods from the same season such as King Salmon & morels. In the South, they are often fried with potatoes in bacon fat. In fact, ramps are so delicious that they are considered a threatened species in some places where they don’t grow as voraciously as they do in Appalachia. Maybe someday ramps will be as endangered as blue fin tuna due to demand. Real talk. Tonight I am going to try grilling mine and serving them with Prather Ranch skirt steak tacos on Rancho Gordo tortillas ($3). How would/do you prepare ramps? Let us know in the comments. This weekend was a busy one for the ladies of Winelandia. We had a packed agenda for Saturday – the Wind Gap Open House (in their new winery!) and the 7% Solution tasting in Healdsburg. Sunday we had reservations at Manresa in Los Gatos. Colleen brought a friend – Miss Naomi – the mastermind behind the Seattle food blog The Gastro Gnome. Two wine bloggers, one food blogger, perfect weather and a Fiat 500 convertible equals the best of times. The Wind Gap open house is one of the finest in all of Winelandia. They pour a plethora of wines and serve the finest foods you could imagine. We first tasted through Pax Mahle’s second label called Lucques – lovely and affordable wines that are thought-provoking and ready to drink now. They are priced from $18-$24, which is a steal for such lovely and interesting wines. We hope to add these wines to our line-up once our ABC applications are approved. We started on the Wind Gap Trousseau Gris ($24), Lucques Blanc ($22), Lucques Rosé ($18) and then wandered inside to taste the rest of Wind Gap’s wonderful creations. There were a variety of Chardonnays (Yuen, Brousseau & James Berry Vineyard), then moved on to the Grenache, Gap’s Crown Pinot Noir, Mourvedre & Sonoma Coast Syrah. My favorites were the Trousseau Gris, Lucques Blanc, Grenache & Mourvedre. Colleen loved the Brousseau Vineyard Chardonnay, which I also love. Maybe Wind Gap doesn’t make wines we don’t like? Totally possible. One of my favorite things about this open house is the food that they serve to highlight the wines. We had blue point & kumamoto oysters, a QUARTER-WHEEL of Fiscalini Cheddar (maybe we were in heaven? ), a variety of Charcuterie and grilled Sausages. After the Wind Gap open house, we headed off to Healdsburg for the 7% Solution tasting. This is a first-time event which showcases wineries that produce wines from obscure varietals. The name is called 7% because 93% of California’s vineyards are planted with money-maker grapes such as Cabernet Sauvignon, Chardonnay & Pinot Noir. This event was a homage to the less-planted and appreciated red-headed stepchild grapes such as Trousseau Gris, Vermentino, Mourvedré, Pinot Gris and a bunch of others that are too hard to recall because they are just THAT crazy. We were pleased to run into Scott Schultz, the winemaker for Jolie-Laide. He makes just a few wines and we got to try two of them at this tasting. There was a direct-to-press Pinot Gris which was bright, fresh and fun to drink. His other wine was a skin-fermented Trousseau Gris ($24). If you see this wine in a store or on a restaurant wine list, do NOT hesitate to buy it! It’s so great! I didn’t catch the vintage (I would guess it was a 2011?) because I was so distracted by the babes on his labels. Hubba Hubba!!! All in all, it was a great day. It was really fun to try so many new wines by so many up-and-coming producers. I am especially excited about the fact that a lot of these esoteric wines are so inexpensive. I hope that we can showcase these wines on Winelandia once our store-front is set up. Keep an eye out for more of these great wines in future posts. Arnot-Roberts is a magical unicorn amongst California wine-makers. It all started in 2001 when two childhood friends Duncan (Arnot) Meyers and Nathan Lee (Roberts) started their wine-making operation in Healdsburg. The two of them are producing a microscopic 2000 cases per year, a total of thirteen (!) different wines. Theirs are considered the best of the best amongst natural California wines and their tasting room is not open to the public. The only times you can get to see the facility is either on a pick-up day (if you get on their mailing list, you will be notified of new releases and can schedule to pick up your wine twice a year) or during their open house, which was just this last weekend. Colleen and I were lucky enough to make it over there both times. Arnot-Roberts is very well-known for their Syrah, which they ferment 100% whole cluster and age only on French Oak. They also produce some very elegant Cabernet Sauvignon, a super fresh & fun rosé (of Touriga Nacional and Tinta Cao), Chardonnay, Ribolla Gialla, and a white field blend (our personal favorite). You can find their delicious wines at a few retailers in the Bay Area but the best way to get their wines is by joining their mailing list and receiving an allocation email each time their new wines are released. You can join their mailing list here. These guys really know how to put on a party. The food was fantastic! There were platters of charcuterie, cheeses, what I am certain was artisinal bread, warm omeletes with seasonal vegetables and plenty of wine, of course. Even the white cloth tables were decorated with lovely pink peonies and roses. Colleen and I were having the best time. After all, it’s not often we are lucky enough to try so many Arnot-Roberts wines in one sitting. However, we overheard that Ryme Cellars was also having an open house, so we hastily finished our Meyer lemonade and made a bee-line for my car so we could get to the Ryme winery before their open house was over. I first heard about Ryme’s wines while I was picking up my allocation from Wind Gap, with whom they share a wine-making facility in Forestville. Ryme is a husband-and-wife operation run by Ryan & Megan Glaab. Ryan is the assistant winemaker for Pax Mahle, the owner and wine maker for Wind Gap. Ryme produces wines from obscure varietals such as Ribolla Gialla, Aglianico & Vermentino. Their second label, Verse, produces Sonoma Pinot Noir and Chardonnay. We were quite excited for the opportunity to try a pretty complete line-up during our visit. I particularly enjoyed their 2010 Ribolla Gialla which was a lovely amber color from the month it spent macerating on the skins post-fermentation. Colleen wanted to buy all of the wines. I had to hold her back so that we didn’t overload my tiny little car so full of wine that the bumper scraped the ground (between the two of us, we have been pretty close). We settled on a bottle of the Ribolla Gialla. We are excited to see what else Ryme has up their sleeves. They have only been producing wine since 2007, which means they are just getting started and will hopefully wow and zow us with all sorts of crazy wine in the years to come. Definitely call them up and stop in for a tasting (by advance appointment) if you are in the Forestville area, you won’t be disappointed. I have also seen their wines for sale at Arlequin Wine Merchant in San Francisco. Every month or so, my friends and I get together to pitch in some money and taste wines we normally wouldn’t try. Colleen and I take turns hosting these events from our homes. Generally we have a theme such as Domestic Pinot Noir, French Chardonnay, Syrah, or Rhone Whites. We usually have around 12 people that come, which is the perfect number for a tasting since a bottle of wine contains approximately 25 oz. That means each person ends up with a tasting-sized pour and can go back for seconds if they want to revisit. Our last tasting’s theme was Domestic Pinot Noir. To determine the event’s theme, we conduct a poll within the group. Domestic Pinot Noir has been a close second for the last few polls, and this time we decided to pick it because we love to honor the underdogs of the world. I collected examples of wines produced from this noble grape from many of the important growing regions in the US. This included Willamette Valley (OR), Russian River Valley (CA), Anderson Valley (CA), Sonoma Coast (CA), Santa Cruz Mountains (CA), and Los Carneros (CA). While most of the wines were red, we did have one Rosé and a Pinot Noir-dominant sparkling wine. I felt it was important to show people that PN doesn’t just make red wines, but also pink and sparkling. Pinot Noir produced domestically is very different from its Burgundian forefathers. It tends to be more fruit-forward, higher in alcohol, and less mineral-driven. However, that isn’t always the case. American winemaking styles dictate some of the outcome, while terroir & weather dictate the rest. California does have some rocky limestone soils, but it is in much smaller and less consistent swaths than the soils of Burgundy (which have tons clay & limestone). Burgundy was under the sea approximately 150 millions of years ago. Sediment created by ocean life, which settled to the bottom of the ocean over long periods of time, eventually fossilized into limestone. Seashells can still be found in the vineyard soils of France. Mineral soils are largely what produce “minerality” in wines, that stony or earthy backbone which you may or may not notice. Thusly, wines grown in mineral soils can have a mineral character, although it can be quickly overshadowed by unbalanced ripeness and heavy-handed winemaking techniques. You can still find domestic wines with a mineral element, although they can be hard to weed out and expensive. Domestic wines historically have been produced with much riper grapes, more oak, and with more manipulation than fine Burgundy. There has been a shift in recent years for domestic Pinot Noir producers to make wines that are a more pure expression of the terroir. I hope this is a trend that sticks around. Back to the tasting: I believe that wine should be enjoyed with food, so I love to create a tasting menu to be served along side the wines being poured. Pinot Noir can be so different between producers and regions that it allowed me to pair all sorts of foods. I like to stick with “classic” pairings, and then do a little bit of experimentation. TL;DR – Pinot Noir loves mushrooms, cheese, onions, fennel, herbs, beets and duck. You could also do no wrong with herb roasted chicken or vegetarian dishes. The crowd favorite of the night was the Neely Santa Cruz Mountain PN. It was lovely; brooding, balanced and complex. My personal favorites were the Iron Horse Brut X and the Hirsch San Andreas Vineyard PN. The Iron Horse is one of my favorite Green Valley wines of all time; bone dry with an ethereal creaminess while still having a crystalline structure. The Hirsch stood out in the crowd because of its mineral backbone and earthy character; it was unlike any of the others in the room.